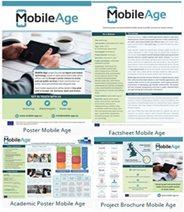 We proudly present you the first newsletter issue of Mobile Age project (www.mobile-age.eu), an EU co-funded project which started in February 2016 and will be running for 36 months. The consortium consists of 10 partners coming from well-known institutions, academia, organizations and NGO based in Belgium, Germany, Greece, Norway, Spain and United Kingdom. Aiming to develop inclusive mobile access to public services using open government data, Mobile Age targets a group of citizens that is usually marginalised when it comes to technical innovations but which is rapidly growing in number and expectations: European senior citizens. Such digital mobile applications will be tested in four pilot sites in Europe (UK, Germany, Spain and Greece). Mobile Age is based on the concept of co-creation. This means that older persons themselves will decide which services they want to access, which kind of applications they would like to use, and which requirements in terms of accessibility and mobility they opt for. This will allow citizens, in particular senior citizens, to become part of what we call open government. The overarching goal of project is to produce digital mobile applications which can be used and scaled-up by local authorities throughout Europe. To do so, it will develop a technical innovative platform, the Open Senior Citizen Public Service Engagement Platform (OSCPSEP) to build the applications. Mobile Age partners will make sure that the platform can easily be re-used in other contexts and by other public authorities. Moreover, Mobile Age will issue a Best Practice Guide for Co-Creation of Open Public Services and publish policy briefings targeting European, national, regional and local public authorities. Mobile Age will also publish a framework for impact assessment and evaluation for co-creation approaches in the field of open public services for older persons. In this first Newsletter Issue you will have the opportunity to read all the project news of these last months, the progress made, the workshops organised as well as the materials created for the project' s dissemination. Also, other interesting news of related thematic areas and upcoming events are included in this issue. We hope you will enjoy the reading and welcome to the Mobile Age project community! Mobile Age started officially its work with the participation of all partners in a two-day meeting on February 9th and 10th at the University of Lancaster, United Kingdom. During this meeting, all partners introduced themselves while the responsible partners per work package presented the work that needs to be done within the project’s lifetime. Various issues have been discussed and all consortium was enthusiastic to start working in full force to run the first activities of the project: collection of the first requirements for the technical platform, engagement of senior persons in the UK and German pilot sites and organisation of the first co-creation workshops. Mobile Age Website: get an easy access to all project information! The project website is the major and fully updated channel to get all the information related to Mobile Age. Visitors can learn about the project, its methodology, its work packages; contact its consortium; and, access its resources. Mobile Age joins social media world! "Connect to" us on LinkedIn! Mobile Age in detail: check out our promotional materials! On May 23rd, 2016 the first project press release was launched to media outlets at European and local level announcing the project' s scope, objectives, methodology, participating consortium partners and the expected results. 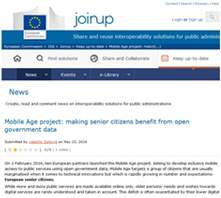 Joinup is a collaborative platform created by the European Commission and funded by the European Union via the Interoperability Solutions for European Public Administrations (ISA) Programme. It offers several services that aim to help e-Government professionals share their experience with each other. Institute of Information Management Bremen GmbH (ifib), Mobile Age partner, conducted the recruitment and co-creation activities in close cooperation with local stakeholders and have formed the "Project Team Osterholz" to support its activities in Bremen' s district Osterholz where the first field work is performed. Mobile Age was promoted via the local newspaper which most of the senior citizen population reads. 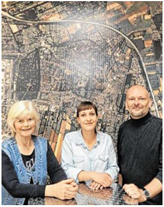 Ingrid Osterhorn and Johannes Irmer (in the picture) are both members of the editorial team of the senior citizen online portal Osterholz (BORIS Osterholz). Ms. Osterhorn, who is also a member of the district council of Osterholz, organised the meeting with the journalist. The article was based on a conversation with Ulrike Gerhard from ifib. The article in European Data Portal is under the title "European Project to develop digital services for the older generations" and has been published on June 3rd, 2016. It mentions: "While it is no longer uncommon to have your grandparents on Facebook, talk to them on Skype or send them videos on Snapchat, the number of services targeted at the elderly is still very limited. Considering their growing technical capabilities, this is a missed opportunity. To overcome this, the Institute for Information Management Bremen in Germany has started the project "Mobile Age" to develop applications fitted to the needs of the elderly". At the beginning of 2016, all action groups have renewed their action plan and the new one from the age-friendly environments Action Group includes a sub-objective on inclusive smart cities. Mobile Age therefore took this opportunity to commit to support the Action Group on age-friendly environments, and in particular its sub-objective on inclusive smart cities. The EASST/4S 2016: Joint Conference of the European Association for the Study of Science and Technology (EASST) and Society for Social Studies of Science (4S) will take place from August 31st to September 3rd 2016 in Barcelona. Mobile Age partners, Juliane Jarke and Ulrike Gerhard from ifib, will attend and present the “Participatory Open Data Study” (D7) on the track "Data-driven cities? Digital urbanism and its proxies". More information on the Conference find here. On 23rd of May 2016 the first information event about Mobile Age took place in the Bremen, district of Osterholz. Senior citizens from the district were invited to jointly design and develop a mobile application for their district together with the ifib project team, namely Dr. Juliane Jarke, Prof. Dr. Herbert Kubicek and Ulrike Gerhard. Thanks to the support of the local online editorial team BORIS for the recruitment of interested senior citizens and the districts authorities’ office where the event took place, around fifteen senior citizens from Osterholz received information about the project. Mobile Age’s field site in Bremen kicked-off the co-creation activities in Osterholz. On 8th of June 2016 the Institute of Information Management Bremen GmbH (ifib) conducted the first workshop with 12 interested participants in a meeting room of the district’s administration office. The participants were recruited with the support of a local project team at the information event that took place on May 23rd. The goal of ifib's co-creation activities in Osterholz is to jointly design and develop a mobile public service application for senior citizens which will facilitate social inclusion. eGovernment4EU online platform: participate and share your ideas! Report on "Mapping of effective technology-based services for independent living for older people at home"
Mobile Age Newsletter is published by the Mobile Age consortium. The views expressed are purely those of the authors and may not, under any circumstance, be regarded as stating an official position of the whole consortium or European Commission. Neither Mobile Age consortium nor any person acting on its behalf is responsible for the use that may be made of the information in this publication.